Pro Tect® Traffic Guard is a fire retardant floor and wall covering that can protect all kinds of hard and soft floor and paneled surfaces while you finish your project. Start on counter-tops, cabinets, wainscots; preserve concrete finishes, brick, stone, terrazzo, tiles, resilient floors in Hospitals, Offices, Condominiums, Institutional structures and Residential construction of all kinds. 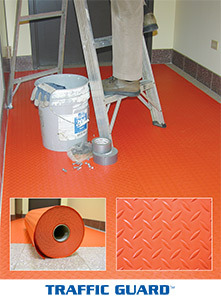 OSHA Orange with a slip resistant surface, Flame Retardant, and in thicknesses ranging from 7 mil. to 40 mil. PRO TECT® Certified; if we say it is good you know it is great! PTGFR.13OD36-300 1-roll, 13-mil, 36″ x 300′, 900 sf 57 lbs. PTGFR.25OD36-150 1-roll, 25-mil, 36″ x 150′, 450 sf 57 lbs. PTGFR.40OD36-100 1-roll, 40-mil, 36″ x 100′, 300 sf 57 lbs.